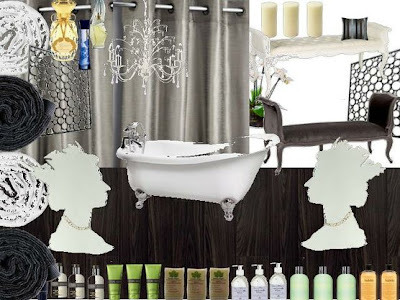 Create this ultra fem bathroom with dark wood floors, an upholstered bench with pillows, a stand alone bathtub, elegant lighting, and candles. Look for mirrors wtih decorative frames, or unique cuts (like these amazing Queens Head mirrors by Giles Miller). Display your products on glass shelves for a spa feel. Use a black and white color scheme with luxurious silver curtains and fresh flowers. Make your own moodboard at www.mydeco.com. Cool moodboard! love your designs - more please!